Go big or go home! That is the motto Thermaltake lives by with their new Bigwater 760i Watercooling Kit. The Bigwater 760i's main cooling unit that comprises a high powered 500L/hr pump, reservoir, motorsports radiator, and 120mm Blue LED Silent VR Fan fits together neatly in two open 5.25" consecutive drive bays. This keeps everything together and out of the way of your computer’s other componentry allowing improved case airflow over other watercooling solutions. 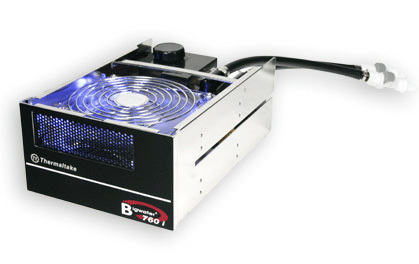 The Bigwater 760i utilizes a solid brazing copper CPU waterblock for the ultimate heat transfer between your processor and the coolant flowing through your system. Each tubing connection throughout the system utilizes Thermaltake's Quick Disconnect Connectors spec'd out for 3/8" tubing, and easily allows you to integrate other waterblocks such as Northbridge or GPU blocks. Whether you are running AMD or Intel's latest processors, the Bigwater 760i Watercooling Kit from Thermaltake will divide and conquer your system's heat!